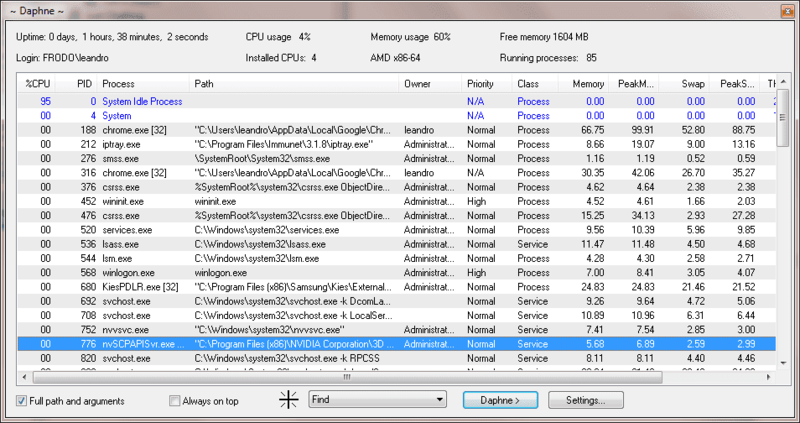 Daphne is a small application for killing, controlling and debugging Windows’ processes. It was born to kill a windows process and became almost a task manager replacement. You can kill a process by dragging the mouse over the windows, by right-clicking the process in the main process list, or by typing its name with the “Kill all by name” command. You can set a any window to be always on top, to be transparent, to be enable, et cetera. Although Daphne was born just to kill windows process. You can think of Daphne as a task manager replacement. The main window displays a list of currently running process with detailed information about: CPU usage, Process ID, Process name, Full path (and arguments), Priority, Class (Process / Service), Current memory usage, Peek memory usage, Current swap usage, Peek swap usage and Number of threads. You can hide applications, hack programs GUI, and inspect deep process information.